L-OptiZinc is a patented form of zinc complexed with the amino acid Methionine. Research has demonstrated this product to be better absorbed and retained longer compared to several other forms of zinc tested. Zinc is one of 16 essential trace minerals your body needs for optimal health. Next to iron, it is the most abundant mineral in your body and is found in almost every cell. Zinc is central to the proper functioning of more than 300 enzymes and is essential for proper growth and development. Low levels of zinc have been detected in people with a number of conditions including diabetes, eating disorders, male infertility, diarrhea and osteoporosis. Zinc supplementation may be beneficial in these cases. One of zinc’s prime uses comes in boosting the immune system. People who are deficient in zinc are more susceptible to infections. Zinc supplementation improves immune system function helping protect against colds and upper respiratory illnesses. Zinc lozenges have been shown to be particularly effective in reducing the severity and length of colds. Because of its immune boosting capabilities, zinc has also shown benefit in treating Candida or yeast infection in women. This effect may be enhanced by combining zinc with vitamins A, C and E.
Individuals facing surgery are encouraged to take sufficient zinc, vitamin A and vitamin C before and after surgery. Studies show that taking sufficient amounts of these nutrients can optimize wound healing. Men may benefit from zinc for two common problems. The hormone testosterone requires zinc for its production. Infertility resulting from low testosterone levels may respond to increased zinc intake. Symptoms resulting from an enlarged prostate or benign prostatic hyperplasia (BPH) may also be relieved with additional zinc. 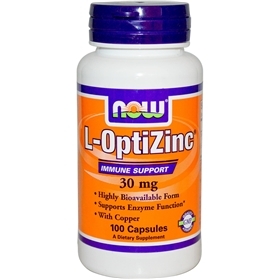 L-OptiZinc is the only high-potency zinc supplement FDA-approved safe for human nutrition. L-OptiZinc is a patented 1:1 complex of zinc and 100% natural methionine, the amino acid that is best absorbed by the body, and serves as an antioxidant. Studies show that L-OptiZinc is absorbed better, retained longer and is more effective than ordinary zinc supplements tested. It also resists binding with dietary fiber and phytate, organic compounds that inhibit zinc absorption. Suggested Use: As a dietary supplement, take one capsule daily. Free of: yeast, wheat, corn, soy, gluten, milk, egg, sugar, salt, preservatives.